How soon is too soon to cash in on a celebrity? In the old days, it was after the funeral. Now, thanks to internet speed, entrepreneurs start cashing in minutes after the announcement of a star's death. And that is turning out to be the case with Prince. Just hours after his unexpected death at age 57, albums, T-shirts, and other memorabilia was soaring in price on eBay, and at vinyl record stores across the country. 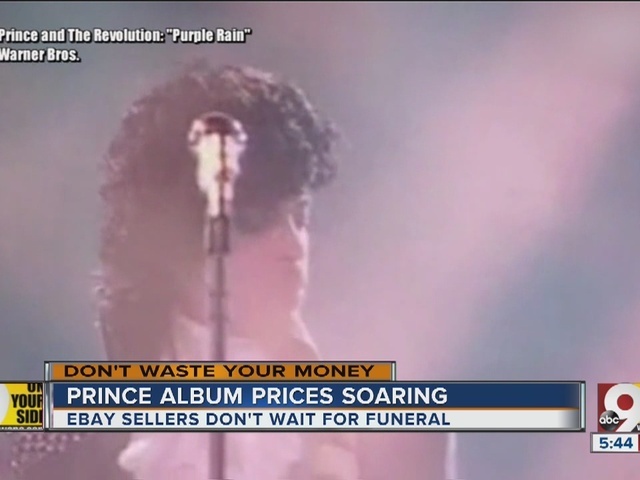 Just days ago, you could find an old Prince vinyl LP selling for $10. Now those prices are soaring to over $1,000 in some cases. A mint, unopened collector edition version of Purple Rain was listed on eBay with a Buy it Now price of $2,500 for a few hours. Some other listing are asking for $1,000 . At least you get a bonus poster for your your thousand bucks. Excellent condition Purple Rain albums were asking $200 - $400. Average used versions were popping up with Buy it Now prices of $100. Collectors, though, say while 1984's Purple Rain may be his best known (and best selling) album, it is by no means rare. It is one of the most common vinyl albums still in closets and attics everywhere. If you want rarity, collectors say, look for The Black Album, which sold in much smaller quantities. And the Holy Grail of Prince items is the double LP of Lotus, with just several thousand pressings on vinyl. If you have that, you truly have a collectors item. Also, look for "limited edition" pressings. If you would like to make a purchase, your best bet may be waiting 3 or 4 weeks. When Michael Jackson died, album prices soared in the same way, but a month later most had come back down to earth.